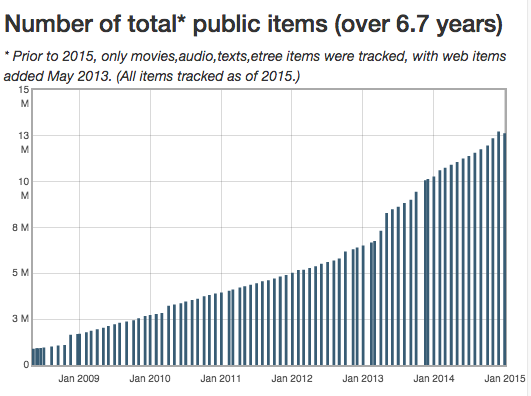 Every month, we look over the total download counts for all public items at archive.org. We sum item counts into their collections. At year end 2014, we found various source reliability issues, as well as overcounting for “top collections” and many other issues. Rebuilt a new system to use our database (DB) for item download counts, instead of our less reliable (and more prone to “drift”) SOLR search engine (SE). 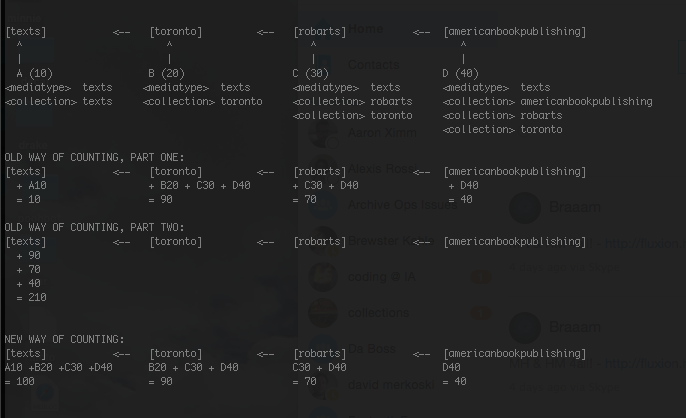 Changed monthly saved data from JSON and PHP serialized flatfiles to new DB table — much easier to use now! For items we are tracking <contributor> tags (texts items), we now have a “Contributor page” that shows a table of historical data. In the below graph, mediatypes and collections are shown horizontally, with a sample “collection hierarchy” today. So we now treat <mediatype> tags like <collection> tags, in terms of counting, and unique all <collection> tags to avoid items w/ minor nonideal data tags and another kind of overcounting. A collection has a really *hot* item one month, racking up downloads in a given collection. The next month, a DMCA takedown or otherwise removes the item from being available (and thus counted in the future). The downloads for that collection can plummet the next month’s run when the counts are summed over public items for that collection again. So that collection would have a negative (net) downloads count change for this next month! Use the current month’s collection “item membership” list for current month *and* prior month. Sum counts for all those items for both months, and make the graphed difference be that difference. In just about every situation that remains, graphed monthly download counts will be monotonic (nonnegative and increasing or zero). This entry was posted in Audio Archive, Books Archive, Education Archive, Image Archive, Live Music Archive, Movie Archive, Music, Software Archive, Technical, Video Archive and tagged collections, documentation, downloads, statistics. Bookmark the permalink.